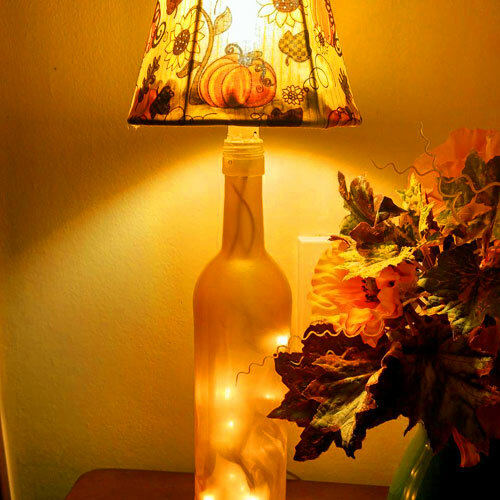 I made a fall bottle lamp, and made my own lampshade cover using old lampshade frame. Also painted bottles I got the idea from Pinterest. 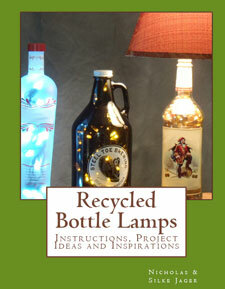 I discovered a drill press is definitely the way to go when drilling holes for bottle lamps. Found plug-ins with switches so that I didn’t have to do as much splicing with the lamps. Also my candy corn bottle I turned into a tiki torch. I post pics of my bottle projects so far on FB on my bottle art just for fun/not selling anything page Botololuso page on Facebook. I’m really just getting started and learning a lot as I go. Anita / Michigan where fall is always colorful. 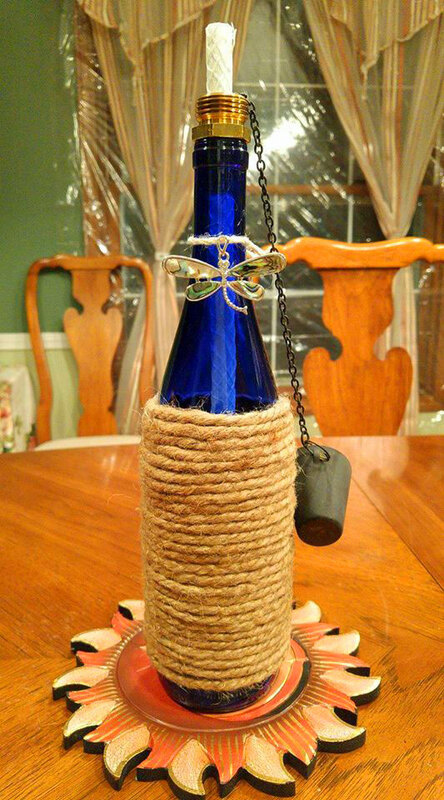 This Tiki torch will brighten up the backyard party and provide mosquito repellency! 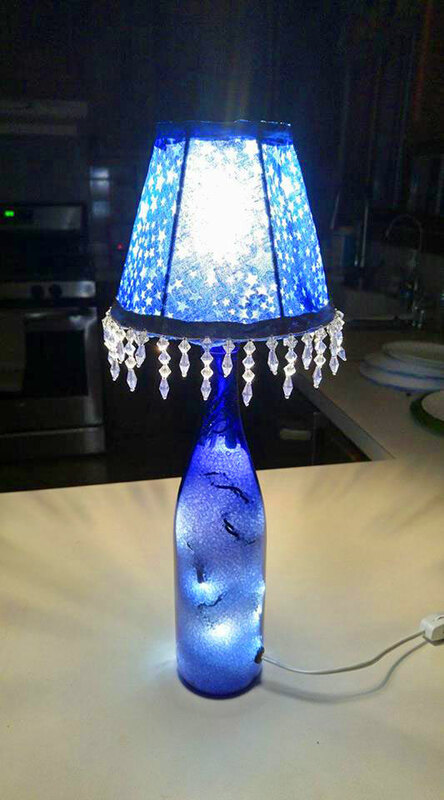 This cobalt blue bottle has a handmade lamp shade that helps compliment it’s color! These are all my first attempts at bottle lamps, torches, painted bottles. I’m hard on myself and notice every flaw – especially in my lampshades, but I guess for my first tries, they’re not too bad. My retirement dream fantasy would be to live in a tiny traveling gypsy house making/selling bottle lamps, wind chimes and tea light holders. 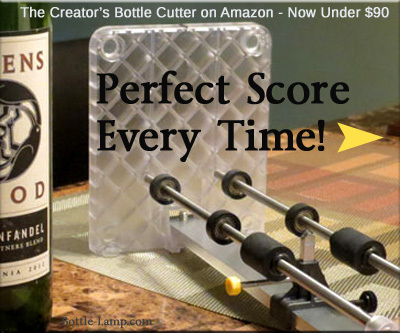 Of course, I have yet to purchase the bottle cutter. That will be my next thing. 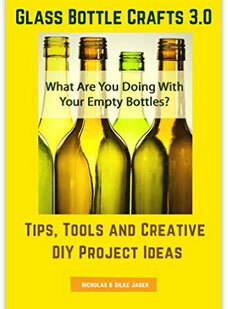 We would like to thank Anita for sending us her DIY Show Off projects. Be sure to leave her a comment below. Submit your entry – include your picture(s), your name and a description and or any tips you would like to share with us and our readers. 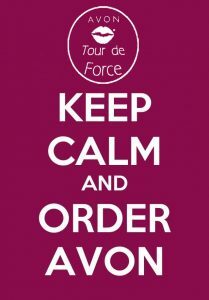 If you have a blog you can also include the web address and we will link back to you.